Saint Peter and Saint Paul Day in Peru falls on June 29th but may be a few days before or after depending on if the holiday falls on a weekend. 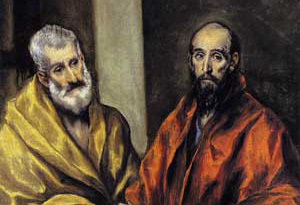 This day commemorates the martyrdom of both Saint Peter and Paul. People will take the day to reflect on the sacrifices these two apostles made in the name of Christianity. Some in coastal communities will decorate their boats to praise Saint Peter the fisherman. This day is a national holiday with most government and business offices closed. Peter and Paul were both imprisoned in Mamertine prison of Rome and that it is believed that Emperor Nero demanded their deaths. Peter was crucified were Paul would have been beheaded which was a quick death because he was a Roman citizen.